In a bid to scale new heights and court success, new-millennium businesses must make their mark in today’s technology-driven global marketplace. However, organizations require top-quality and cost-effective technical support to implement strategic business moves and stay ahead of competition. Access to latest IT & communication technologies, along with a large pool of qualified professionals, salary arbitrage, and favorable govt. rules have made India the most preferred outsourcing hub for global enterprises looking for end-to-end software solutions and maintenance services . Based in Bangalore, Go2India caters to diverse industry verticals and specializes in high-performance, fully customized application development. Consultation, testing, portal designing, and technical support further complement our value-added service suite. Whether you are looking for a new application or want to upgrade your existing system, the BPO leader will offer custom solutions to meet your business requirements, optimize your profits, and help you gain competitive edge. State-of-the-art offshore development center and experienced IT professionals to ensure the quality, security, and agility of your custom applications. Unbeatable expertise across key industry verticals and multiple technology platforms. Mature technical and management processes based on best industry practices. Compliance with international quality standards. Cost reduction and faster turnaround through reliable offshore outsourcing. Dedicated project management and round-the-clock customer support. Time zone advantage and global delivery model. 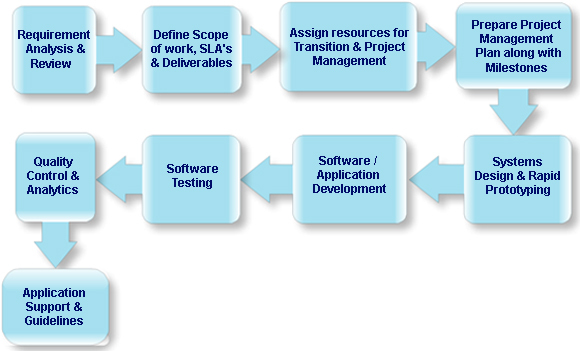 or customer service with back-office operations.To design and develop the right application for new-millennium enterprises,we provide a strategic combination of Speed and Technology, and offer a radical software engineering platform that can be quickly and effectively tailored to fit custom requirements. Go2India leverages your current IT assets and also adopts latest technology innovations to develop applications and software systems intended for enhancing/re-engineering business processes. We create robust architectural models and use visual modeling tools to increase productivity and thus reduce development costs. The company works with reputed international clients – enabling them to converge business & technology strategies and benefit from quicker turnaround time. In other words, our solutions ensure that you reap immediate returns on your investment in business development and IT process improvement. specifications. We also design portals, conduct independent software testing, and develop high-performance business intelligence solutions within any data environment. Go2India specializes in application enhancement as well, working on existing architecture and upgrading as per requirement specifications. Go2India is second to none when it comes to a well-defined and mature application development process. Our expertise in customized applications development is effectively supported by comprehensive understanding of advanced technologies and cross-platform tools, diversified programming skills, and exceptional software engineering capabilities. In a bid to address real-life development issues, Go2India constantly endeavors to bring parity between the development and the production environment, and cut down on all operational hitches in the process. Moreover, optimized & efficient usage of open-source software has immensely benefited our clients by reducing development costs. The dedicated and experienced team at Go2India focuses on analyzing client requirements and correctly translating the same to system architectures. We effectively manage knowledge and technology transitions to ensure seamless productivity while you lift services to the next level, enhance customer relations, and maximize growth and profit margins of your organization. In a bid to build the right application and ensure quick TAT (turn around time), the company has opted for “collaborative innovation” – an ideal environment where our consultants work in close association with the client to obtain desired results. Transition is all the more crucial when it comes to upgrading/converting legacy systems without expensive and time-consuming re-validation. Whether you are offshore outsourcing an entire business process or keen to be connected with latest technologies, software engineers at Go2India will help you implement effective strategies and assist you in intelligent upgrades to existing systems. Go2India offers impeccable project management services – so that each venture, large or small, remains on its intended course and within its pronounced budget. We develop comprehensive project management plans (PMPs) by defining project goals and objectives, detailing budget and resource requirements, specifying development procedures, and stating milestones and timelines. Effective monitoring, scrupulous reviews, and continuous improvements are carried out throughout the project lifecycle to ensure that the plan does not deviate from set guidelines and stay on the critical path. We at Go2India stringently follow all international quality standards when it comes to requirement analyses, delivery excellence, and risk management. We also develop fully scalable applications – so that these can be upgraded later to keep pace with changing business needs and shifts in technology. In a bid to translate your IT vision into reality and create powerful solutions, which can help transform your organization and business, Go2India follows a proven methodology and deliver unmatched business value to customers through a combination of process excellence, quality frameworks, and service delivery innovations. Each of the development phases can be defined with metrics and subsequently tracked with business analytics tools to measure operational efficiency.